Earlier this year, members of Birmingham Friends of the Earth visited Jake. Jake volunteers with Birmingham Friends of the Earth when he is around Birmingham. In spring time this year he was in Portugal. This was a perfect excuse for some BFOE campaigners to visit Portugal and Jake. The trip to Portugal was conducted via trains. On the way home from Porto we stopped over in San Sebastian, which is in north east Spain. 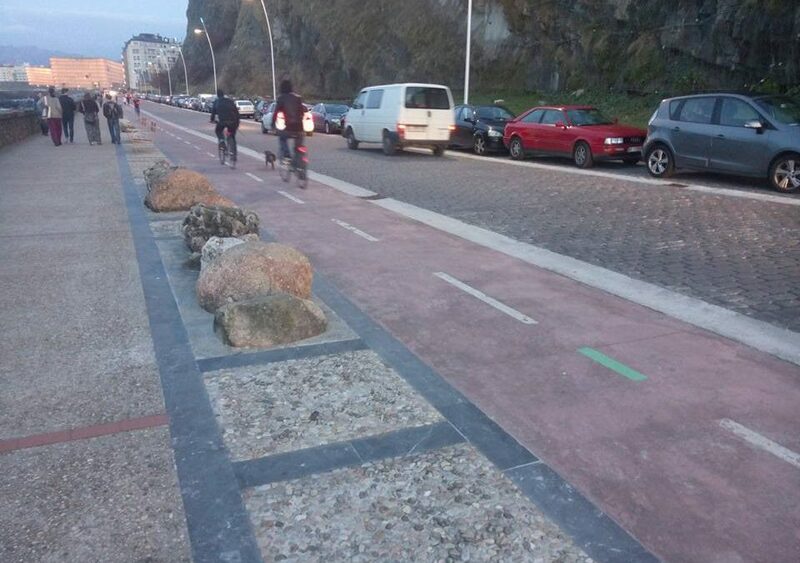 One of the things that I instantly noticed walking around San Sebastian was how cycle friendly it appeared to be. There were wide, segregated bicycle lanes and many places where you could hire a city bike for a short period of time. I like to try and cycle in different countries to the UK to compare how easy cycling is compared to Birmingham. I took the opportunity to hire San Sebastian’s equivalent to a city bike. I was surprised to learn that these bikes were electric. Once you start pedalling the engine kicks in to help you. The bike had several power levels meaning you could go very fast if you wanted to for a bicycle. I started cycling along the designated and segregated cycle lanes around the coast. Because the bike was electric, it was heavier than a normal bicycle, meaning that it was quite hard to manoeuvre. The cycle lanes were very busy, with people of all ages. The vast majority of people were not wearing helmets and no one was wearing a high vis. Mostly, people were wearing their normal hot weather clothes. My impression from watching others cycle, is that cycling around San Sebastian was seen as a normal day to day activity. There was no need for any special protective equipment because cycling is a safe activity. Once I followed the coast around to the other side of San Sebastian I came back on myself and went onto a few different routes. An electric bicycle really comes into its own on a wide open road. I was able to go at near the speed limit, without feeling unsafe. No cars encroached the space around me so I felt safe. For me the electric bike was a bit unnecessary because on the designated cycle lanes, there were too many cyclists to be able to get to enough speed so that the engine could kick in. The bike was very heavy and that meant navigating some of the tighter gaps was tricky. It was pointed out to me that the electric bikes might be in place to encourage older people to cycle. San Sebastian is a coastal town and it looked like a high proportion of the people around were older. This is a good reason to have electric bikes. Just like in other European cities, from Budapest to Vienna that I have visited, where there is excellent cycling infrastructure, there are a lot of cyclists. In places like Copenhagen and Berlin cycling is a normal day to day activity, unlike in Birmingham, where cycling is seen as a niche and dangerous activity. All the evidence suggests that if you put the right infrastructure in, more people will cycle. The massive growth of cycling with the new cycling superhighways in London is a good example of this. If Birmingham wants to tackle problems like air pollution and obesity then making cycling a key part of the transport system is a proven way to do this. I love to cycling in Europe only for their nice cycling way, those are just awesome. No doubt, Europe is miles ahead than the other continents as regards cycling infrastructure and facilities. Even here in the USA, it’s still to catch the Europe, though Canada is doing well. In order to achieve a better and greener world, use of bicycle can play a great role if advocated and facilitated by the governments worldwide.